The area around The Lanes has no shortage of good restaurants specialising in the food of the Mediterranean, so when Olive Grove, already well-known in London, opened their new location in Brighton I wasn't quite sure whether or not they might be setting themselves up for a fall. How can you go about establishing yourself in such a saturated marketplace? The answer: to dot all the Is and cross all the Ts, doing everything just so. This is a deceptively simple strategy, of course! But having been invited to their new premises this week I can say that it looks like the Olive Grove team have managed to achieve it. Even little things, like putting tealights in coffee grounds on the tables, add a little something to the atmosphere and the occasion. Olive Grove's menu is a weighty prospect, a book rather than a pamphlet. This is not always a good sign in a restaurant but in this case it is more of an indication of the variety available. Food from all round the Med is represented as well as a thoroughly impressive selection of drinks - wines from around the world and a selection of Belgian beers to mention just a few. We opted for a Sicilian white wine, which was excellent. Our meal began with a selection of tapas. First were crostini, one topped with a rich, smoky baba ganoush, the other a refreshing red pepper with a delicate touch of dill - another indication as to Olive Grove's attention to the smallest details. This was followed by a luxuriant fresh flatbread and a bold, savoury hummus as well as succulent artichoke hearts marinated in garlic-infused olive oil with red onion. Lastly came an indulgent, crispy fritto misto of carrot and courgette accompanied by a garlic and herb-flavoured soy yoghurt dip. Over the past year I have removed all animal products from my diet, meaning I have far more dietary requirements to think about in restaurants these days! Luckily, Brighton is a great place to live for people wanting to eat varied and tasty vegan food. Olive Grove was no different. Indeed, they were very accommodating and if there had been any compromises made in the food they presented to us, it wasn't at all evident in its look on the plate or its flavour. For the main course, we had both a champagne and herb risotto - smooth, rich and creamy - and a dish of stuffed mushrooms with a punchy olive and sun-dried tomato couscous. Both were delicious, satisfying and filling options. There wasn't much room left for dessert, but a sumptuous plant milk rice pudding with warming spice, banana and chopped pistachio nuts didn't require much arm twisting! Best of all was the zingy and refreshing dish of lemon sorbet with a carpaccio of wafer-thin sliced fresh pineapple in a delicious anise-perfumed syrup. A delicious and pleasingly different end to our meal. It was clear that Olive Grove can go toe to toe with any of their local rivals' in terms of the food on offer, but its real trump card in fact is its location. Tucked away in The Lanes, on the face of it you might think that it would be a disadvantage. 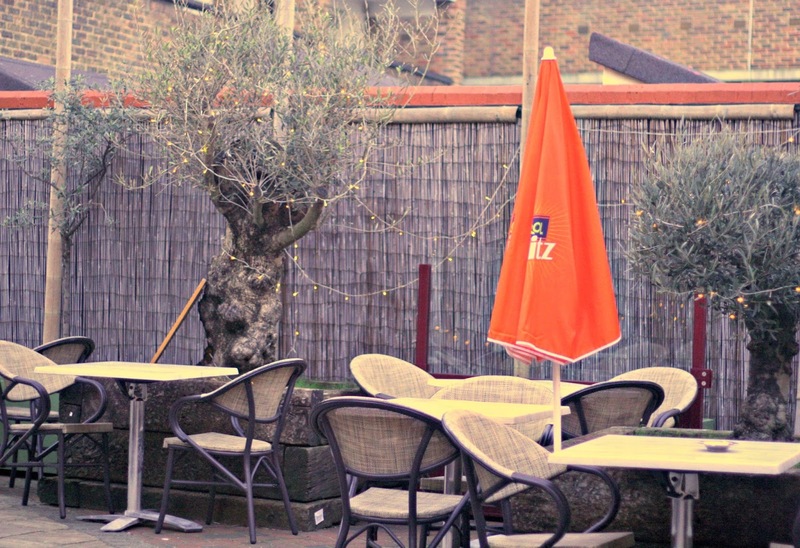 But, wander through their gate and a sizeable courtyard reveals itself, with ample outside seating. A barbecue sits, poised and ready, for some summertime al fresco cooking and, while the manager joked to me that it had seemed a bit like no-man's land out there during the last of the winter cold, there is no doubt it will be one of the places to be come the longer days and warmer weather: a great place to sit after work to enjoy some evening sun, an Aperol Spritz or two and some tasty tapas. I will certainly be recommending it to all of my colleagues! As, indeed, I will to all of you. 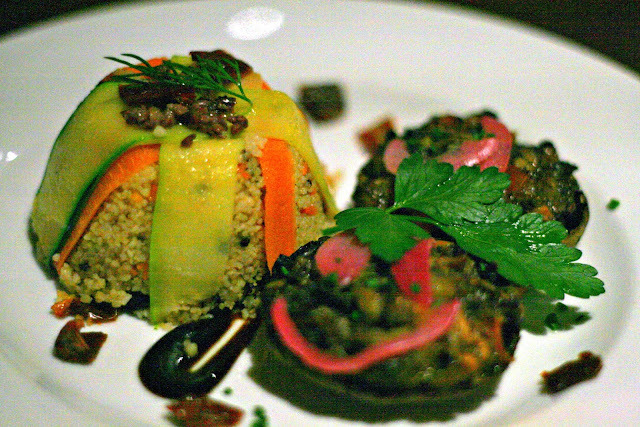 The staff are friendly, engaging and just the right amount of attentive, the location retains a sense of quiet intimacy in spite of its size and the menu features something for everyone - vegans, veggies and meat-eaters alike. Ideal for people who just want an after work drink or a snack, or to enjoy a hearty meal, it deserves to do very well indeed and if every night was like the one I spent there, it will. 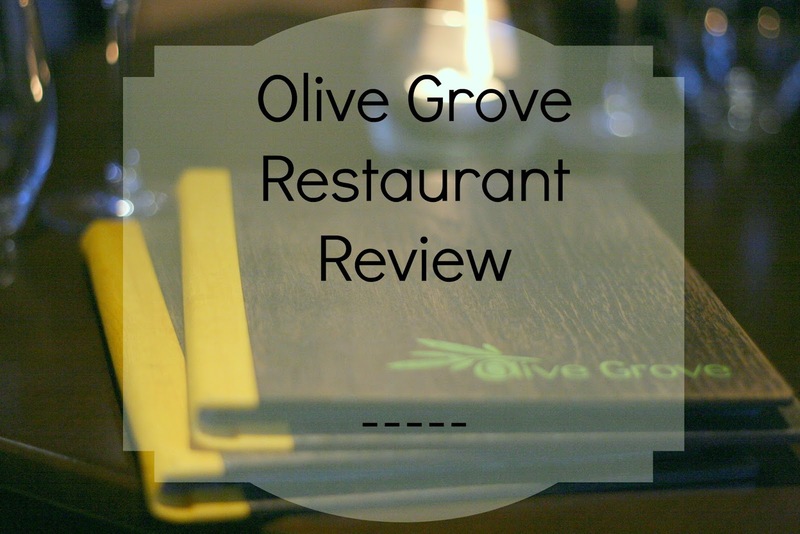 NB: My meal at Olive Grove was provided for review, but all thoughts and words are my own. I ate here last week and thought the food was absolutely delicious. Just a shame that the restaurant was completely empty, such a shame on a Thursday before Easter Bank Holiday! Fingers crossed they manage to stick it out here, I'll definitely be returning. I'm definitely adding this to my list of places I must eat. Sounds divine! I love it when the restaurant cares about what they produce and add lovely little touches. Perfect. 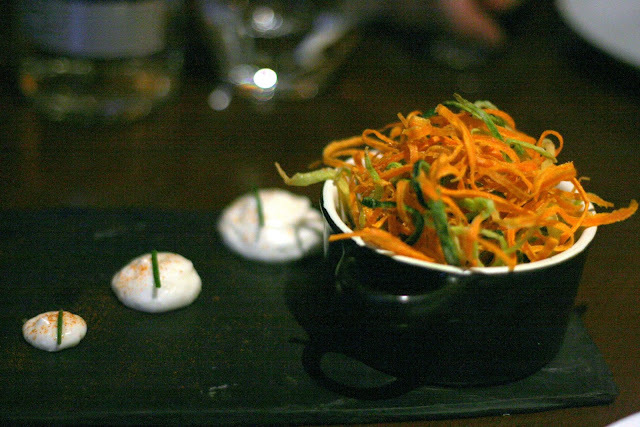 Lovely review – it's so great when places provide interesting and vibrant veggie and vegan fare! I noticed this place for the first time tonight when on my way to Sweaty Betty yoga in the lanes. Deffo gonna give it a go, looks lush!